I must admit, one of my favorite things about summer is planting a vegetable garden! It’s far from perfect, but it works for us. Whatever your space situation is small garden space or big, or even a balcony, this list of 15 unusual vegetable garden ideas has you covered and will get your creative juices flowing. If you live in the city, you are aware that sometimes land comes at a premium. Therefore, if you don’t have a big space, you should consider planting up, rather than out. A vertical garden is perfect for you since it uses a small footprint and creates a beautiful growing wall. Create an awesome growing wall by planting your vegetables in cinder blocks. This will create a unique and sophisticated space. Moreover, the cinder blocks will last indefinitely and weed control will be easier than ever! If you want raised garden beds, why not add some walls for a cozy retreat for your lovely dog? This will saves some space and will make the garden a nice and comfortable height to work in. This is amazing for the city gardeners! This way, you can make a retracting garden that fastens to your window frame. Lower it down to get some sunshine and pull it up when it’s time to water. Awesome! This one is great too! Plant an assortment of your favorite herbs and small vegetable plants, such as tomatoes, and you have a tiny garden that takes almost no effort. 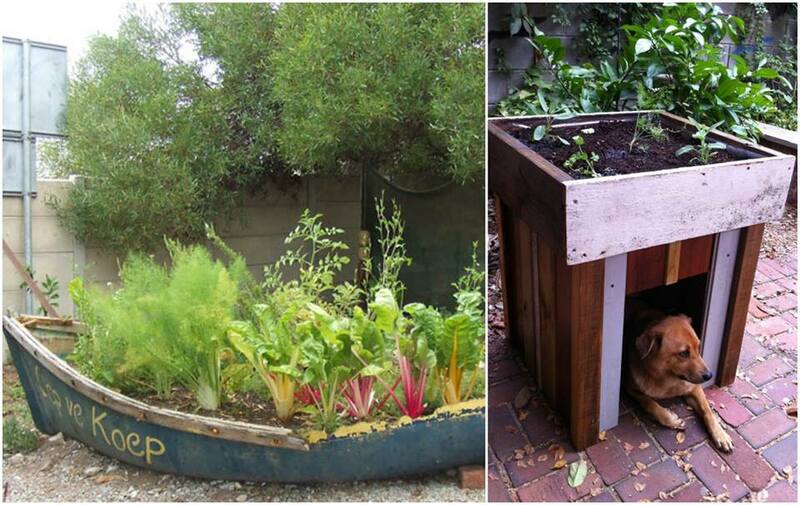 I simply adore my homemade garden boxes! However if you don’t want to make it by yourself, this tiered garden box will help keep the weeds out, and help you keep the plants separated. Plus, you don’t have to dig out a hole in your grass for a garden bed. Repurpose some of those old tin cans into garden containers! Then hang them on a wall for an amazing looking container garden! This one comes with an enclosure that protects from frost and keeps rabbits and squirrels from raiding your garden. The enclosure will allow you to plant your vegetables early in the season too. It doesn’t have to be fancy, and you can re-use any number of things you already have. For instance the garden beds below are made from soil mixing bins and put on a wooden riser. Have you ever considered a bean house? I love this idea and think standing inside the house once the vines are in full bloom would be a brilliant idea. Make your own upside down tomato garden just by using heavy duty buckets and hanging them from a wooden beam in the garden. This will keep the plants out of reach, and the vines that come down will make a lovely green wall! Pallets are very commonly used lately and they do make for a great way to hang a planter on the wall outside, keeping everything well within your reach. This idea is great if you can get your hands on a clean pallet. This one is so cool, don’t you think? If you have an old boat that’s no longer fit for the water, save it! Kids would love this, moreover, it keeps all your vegetables raised up to a convenient height. It gets to be hard on the back when you are constantly bending over your garden. You can make your own or you can buy ready-made kits ranging from simple resin beds to wooden beds with storage underneath and even high end self-watering systems. This seems like such an awesome idea! It keeps everything neat and tidy and with the small holes, you’d never get any weeds! I’m a huge fan of raised garden boxes, but there is certainly nothing wrong with digging out an area of grass in your backyard for a traditional bed. It’s just amazing to see all the options! Share on Facebook to help your fellow gardeners learn these too! You’re showing some planters I would not use. Cinder blocks , some plastic containers and pallets. I have read they can leach toxins into your vegetables.